Air India Boeing 777-200LR VT-ALH. Front view. Engines have been removed for safe-keeping. 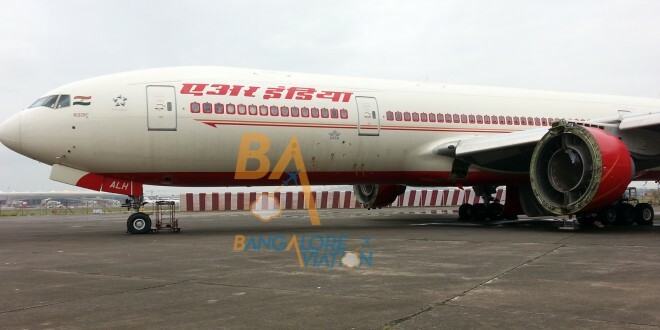 Exactly three months and one day ago, we reported exclusive images of Air India’s newest Boeing 777-200LR VT-ALH Maharashtra lying in a pathetic and dilapidated condition at Mumbai airport. 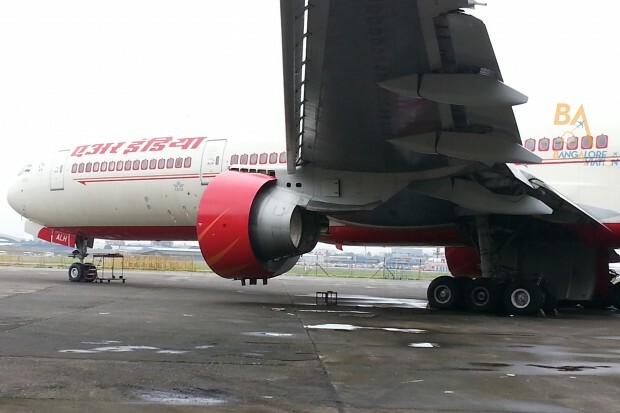 Today we are happy to report exclusive images showing Air India has restored the aircraft to a much better condition. She is looking nice and clean. Since the aircraft has not flown since May 29, 2012, the engines were removed for proper storage given the hot, humid and salty atmosphere at Mumbai. One engine was used to replace the engine which caught fire on Air India Boeing 777-300ER VT-ALR Meghalaya as it performed flight AI144 from Newark to Mumbai on July 13, 2014. Apparently the GE90-110B used on 777-200LRs is identical hardware to the GE90-115B used on 777-300ERs, the variation in engine performance being controlled by software. The other engine is in storage. Air India Boeing 777-200LR VT-ALH. Wing and landing gear close-up. Click for a larger view. [bsu_custom_gallery source=”media: 7978,7977,7979″ link=”image” target=”blank” width=”200″ height=”180″] Informed sources, who do not wish to be named, indicate VT-ALH was stripped for parts to repair and “bring to specification” the first five 777-200LRs that were sold to Abu Dhabi based Etihad Airways PJSC for a measly $336.5 million (as reported by G.M. Siddeshwara the junior civil aviation minister to the Indian parliament). The Boeing 777-200LR has a list price of $305 million at present, though discounts of 30% to 40% are common. Etihad has put those LRs on their Abu Dhabi Los Angeles non-stop service. The gulf carrier has plans to expand its services to the US west coast and as per a report in The Mint, has bid for the last three LRs Air India put up for sale. However, the Etihad wants to lease these three aircraft rather than buy them. Our source has also confirmed their is no damage to the spar of VT-ALH as speculated in the media and Twitterverse. Air India has been using the other two 777-200LRs VT-ALF and VT-ALG to perform rescue missions to Iraq, Libya and other countries, bringing back stranded Indian citizens. As lovers of airplanes, we are happy to see VT-ALH being restored and hope to see her flying soon.